I have a perfectionist tendency that I fight regularly. Along with my love of books, I love to make pictures. When I am in the darkroom or at my computer, I usually get to a place when I have to remind myself not to let perfect be the enemy of the good. You see, once I start to expect constant improvement, the fun slips away. It would seem that I have passed this trait onto my son (a double whammy-nature and nurture). This week I discovered he was hesitant to draw because he isn't "good" and his pictures don't look "just" like the object in his mind's eye. 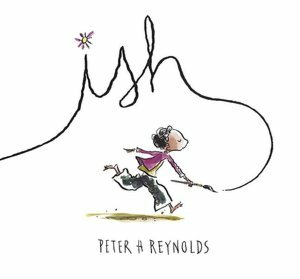 After this talk we resolved to find some books on how to draw and perhaps a teacher, and I went to my bookshelf for ish by Peter H. Reynolds. When I lack the courage to try something new, I regularly reach for it for confidence. It begins with Ramon happily drawing. His brother looks over his shoulder and ridicules the drawing. Not to be beaten by his brother, Ramon keeps at the drawing, but doubt has crept into his work. He becomes increasingly frustrated until he quits with a final crumple of a drawing. He throws it on the floor. His sister Marisol enters the room. She snatches up the drawing that has been cast aside and runs to her room. Ramon follows, not wanting her to have his drawing. He barges into Marisol's room to find a gallery of his work. Ramon tries to explain that the work is missing the mark and just isn't "right." Marisol doesn't argue, but points out that the vase is vase-ish. With this thought, Ramon's joy is restored, as seen in this excerpt from the book. "Ramon felt light and energized. Thinking ish-ly allowed his ideas to flow freely." Reynolds dedicates the book to Doug Kornfeld, an art teacher who, "dared him to draw for himself and find his voice." This fable reminds us that we must be mindful of and carefully tend the creative spark in ourselves and others. 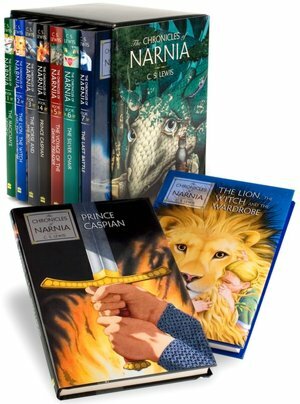 As I gaze at my book shelves there are two book sets that remain from my childhood: The Chronicles of Narnia and Little House on the Prairie. I must admit, I made it through only two of the Laura Ingalls Wilder books, Little House in the Big Woods and Little House on the Prairie. I chose instead to watch the TV show religiously. I did, however, read all of the Narnia books. I started with the first book and made the progression through many times. It is a paper back set and the books barely fit into the original box, because I was so hard on the spines. These days you will find The Magician's Nephew marked as book #1. It is the beginning of the tale and frankly ties for my favorite with the now #2 book, The Lion, the Witch, and the Wardrobe. The Magician's Nephew contains a description of the beginning of Narnia, and it is one of the best creation stories I have ever read. The series has something to appeal to all sorts of readers: heroes in the form of girls, boys, animals and mythological creatures; adventures at sea and on land; friendships made and lost; families divided and reunited; and even a bit of romance. The primary theme of all of the novels is the triumph of good over evil. The theme is particularly poignant when you consider that Lewis imagined it during a time plagued by world wars. I have had way too many sleepless nights lately. Since Friday, I've had an average of 4 hours of sleep per night. As I lay in the dark, I find myself thinking of all of the "visitors" we teach our children to receive as they sleep: the Tooth-fairy, the Easter Bunny, Santa Claus, and the Sandman. The latter was never a friend to my son, but I remember him from my own childhood. I rarely clear my eyes in the morning without thinking of him. I just love the idea of a magical creature with a job! Roald Dahl gives us a good, though unlikely, hero of the magical sort in his wonderfully humorous novel, The BFG. (BFG stands for Big Friendly Giant) This giant does his work during the witching hour-"that special moment in the middle of the night when every child and every grown-up was in a deep-deep sleep and all dark things came out from hiding and had the world to themselves." (The BFG, pg. 10). You see, he is a "dream-blowing" giant. While all the other giants are galloping around the globe finding their favorite "human beans" to eat, Dahl's gentle, big-eared BFG is blowing dreams with his trumpet into the bedrooms of sleeping boys, girls, men and women. One evening, as the BFG is delivering his dreams, he overhears a heart beating too loudly to be sleeping. He turns and spies a young girl, Sophie, staring at him. In a single step he is at her window, reaching through it and snatching Sophie and her covers from the bed in which she is hiding. After fashioning a bag of the blanket, the giant begins to run, slowly at first and then swiftly to Giant Country. Upon arrival, he drops Sophie to the ground and informs her that she is there to stay! Just image the adventures they will find and the dangers they will encounter. Will Sophie survive in a land filled with "bonecrunching giants?" Or will the BFG take her home and risk being put into a zoo "with all those sqiggling hippodumplings and crocadowndillies?" The book is a laugh a minute and is best read aloud, so that the reader and the listener(s) can laugh together at Dahl's jabberwocky (jabberwocky-a playful imitation of language consisting of invented, meaningless words; nonsense; gibberish.). I have been watching Downton Abbey and was struck by the number of times Cousin Violet, the Dowager Countess and Maggie Smith's Character, told her granddaughters, "You are not living in a novel!" I also loved that Violet's response to the electricity was, "I feel like I am living in a H.G. Wells novel." Many other references to reading are made in the series, including Lord Grantham's willingness to lend his books. There is even a small card catalog in the family library. 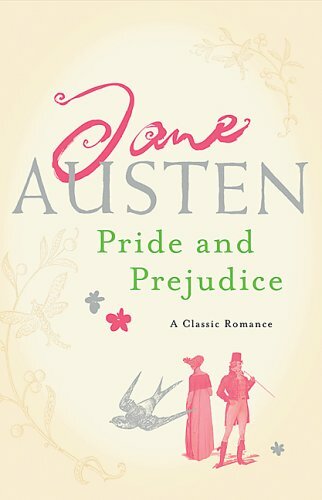 I recently reread Pride and Prejudice by Jane Austen to remind myself of its details before I begin, Pride and Prejudice and Zombies by Jane Austen and Seth Grahame-Smith. The former was published in 1813 and could very well be one of the novels to which Cousin Violet is referring. I love the coy behavior and the way it all feels a bit like a ballet. As I read, I am made ever more curious about the author, Jane, and her scandalous romances. It is possible that her novels were the Fifty Shades of Grey of her day? Have you ever had a day, or even a string of them, that just doesn't fall into place like you had planned. Today has been one of those days for me. It has been good overall, but I just keep coming up wanting. Not getting to everything I had hoped to...I haven't scratched a single thing off of my "To Do List" for the day except running and having lunch with a dear friend. Do you ever stop to think that your kids have the same kinds of days? I know my son does. When they do, they may want to find a friend like Clementine to consult. I am certain that no matter what your reader's day brings them, Clementine's days are worse. On Monday she’s sent to the principal’s office for cutting off Margaret’s hair. Tuesday, Margaret’s mother is mad at her. Wednesday, she’s sent to the principal…again. Thursday, Margaret stops speaking to her. Friday starts with yucky eggs and gets worse. And by Saturday, even her mother is mad at her. Okay, fine. Clementine is having a DISASTROUS week. This delightfully flawed hero can be found on the pages of Sara Pennypacker's Clementine. It is a humorous chapter book for young readers. It is a series, so if your reader identifies with Clementine or the themes, there are many more to choose from. Summer is here in Arkansas and the heat in unforgiving. We have been forced indoors, so I am making may way through a few books. 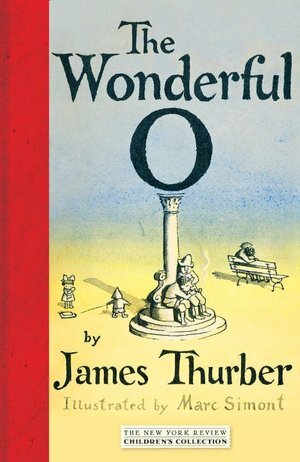 Today, I read one that is perfect for a read-a-loud, The Wonderful O by James Thurger. It has playful prose and witty language. I say, start reading and pass it to a family member when you are tired. It will only take an hour or two to read, depending on how often you pause to discuss or think up you own words. "Taking a single letter from the alphabet," he said, "should make life simpler." "I don't see why. Take the F from life and you have lie. It's adding a letter to simple that makes it simpler. Taking a letter from hoarder makes it harder." As I've said, it is a riot. Oh no, I've used too many "Ooooooooooo's". Our dog is missing as of last night, but we haven't yet told our son. I keep hoping someone will call before he gets home from school saying that he is safe and ready to come home. As I sit here typing, I can only think of two "boy and his dog" books: Old Yeller and Lassie. I am wondering if anybody could make a more modern recommendation. My son is such a reader that I would like to get him a book to read to help him process this loss. Please forward this inquiry to anyone you think would have a suggestion. Any recommendations would be greatly appreciated. My son attends a year round school that my husband runs and I work for, so we are back to school as of yesterday. Among my duties at school, I run the book clubs. Walking in the halls today, some new third graders called out, "Mrs. Bacon, when will book club start." I happily responded, "Soon, very soon..." You see, one must be in third grade to join book club....they have been waiting a long time. If you have a young reader at home, who is beginning to take the leap into chapter books, you must give Kenny and the Dragon a try. It is a wonderful retelling of Kenneth Graeme’s classic tale, St. George and the Dragon. The musical story-telling makes me want to skip around the house, and the illustrations make each of the loveable characters jump off of the page and into your lap. You might recognize the hand in the drawings. Tony Di Terlizzi worked with Holly Black on the Spiderwick Chronicles and illustrated the poem, The Spider and the Fly, in an amazing black and white picture book. I love to find a friend in the pages of a story, and Kenny is as loyal and true as they come. He befriends this highly academic dragon and works tirelessly to protect him when the animals of his village get dragon slaying on their minds. Lately, I have been reading a lot of fine to good books. (Honestly, I never think of a book as bad, but instead that is just wasn't for me). It's always a fishing expedition for me, finding that book that will seduce me into staying up all night. I make every effort to narrow the search, checking other blogs, Goodreads, award lists and especially my horn book guide online subscription for glowing recommendations in my preferred genres, but still, I have been missing the mark. The last book that completely occupied my imagination was Laini Taylor's Daughter of Smoke and Bone. (It was recommended to me by Ever who is part of the staff of my local independent bookseller, Wordsworth). As the sequel, Days of Blood and Starlight, will not be released until November 6th, I've decided to give one of Taylor's other books a try. I will let you know how it turns out. Any book that opens with "Once upon a time" is inviting high expectations. It's a phrase that inevitably evokes fairy tales and leather-bound classics about epic adventures, setting up the anticipation that readers will discover worlds filled with magic…In this case, the story that follows…is a breath-catching romantic fantasy about destiny, hope and the search for one's true self that doesn't let readers down. Taylor has taken elements of mythology, religion and her own imagination and pasted them into a believably fantastical collage. How would you define delicious? If you could use just one food to define delicious, what would it be? If you asked your family and friends to do the same, would it be easy to come to a consensus? Now, imagine a king creating a dictionary for the first time and wanting a single food to describe delicious. You have just created the world of Natalie Babbitt's imagination in The Search for Delicious. In this humorous tale of human folly, a prime minister of a kingdom is making a dictionary and using the best example of a word rather than a definition to complete it. As you might imagine, an argument quickly erupts as the court members each offer their opinions as to what is delicious. To solve the matter, Gaylan, the prime minister's assistant is sent out to poll the citizenry for the answer. While on his quest, Gaylan discovers a kingdom near civil war. He will need help to complete his assigned task and calm the unrest in the kingdom. Help comes in the form of a wordweller and a mermaid. I must say it is an imaginative and well-written tale. There are elements of a coming of age story, legend and brotherly conflict. It is called young adult literature, but if you have an able reader that is younger, they too might find the story worthwhile. Bird watching is one of my favorite pass times. I am not a serious bird watcher by any standard, but flying fascinates me. My son and I regularly try imagining the machines he could build that would improve an individuals ability to just take off from the front yard. The most inspirational flyers, in my humble opinion, are the hummingbirds. If all is going as planned, I try to write or read in the mornings on our screen porch so I can watch them. If I let my imagination go, I can see fairies flying all around me, bringing me good fortune or a bit of mischief. The fairies in the Sisters Grimm Series by Michael Buckley are definitely of the mischievous sort. With their leader, Puck, they give the girls quite a bit of trouble as they try to make sense of the strange life they have landed in after their parents disappearance. (Again, no parents! Are we really such a hurdle to fun and adventure?) After many failed attempts at placing the girls in foster care, the State is finally contacted by a woman claiming to be their grandmother. Anxious to be rid of these particularly "difficult" girls, Mrs. Smirts, hands the children over to the mysterious grandmother with little to no proof of her claim. Suspicious of all adults at this point, Sabrina, the oldest girl, convinces her younger sister to escape this foster home as they have all of the others. The reader might find Sabrina's arguments sound, as the life lead by Relda Grimm at the edge of Ferryport Landing is quite odd, but her sister does not. Somehow, her instincts tell her she is home. In book one of the series, we watch the girls come to embrace their inheritance by conducting an elaborate rescue attempt. If you are a lover of fairy tales this is a sassy read. The girls are delightful, as is their grandmother. In this new look at fairy tales you are likely to come across many familiar friends ranging from the three little pigs to Prince Charming. This is a series, so if your young reader enjoys this first novel, she will be able to find many other "happily ever afters." My son recently observed that many of his most treasured books are written by British authors. Interestingly, this holds true for me as well, with the exception of all of Pat Conroy's and Larry McMurtry's books. He speculated that books written by Americans, Brits, Australians and New Zealanders, would all be appropriate for him, as they are written in English. Because he has traveled to Barcelona, I suggested he try some books by Carlos Ruiz Zafron as well. Even though he is from Spain, he has written many wonderful books printed in English. Zafron started his writing career writing books with the young adult in mind. Among the first is The Prince of Mist. The plot evolves around Max Carver. Max is a young boy recently moved to a small coastal town by his father, a watch maker and inventor. While exploring, Max quickly trespasses on a past which will invade his present. He discovers a fenced garden with a strange statue, a tale of a ship wreck and many tragic endings for the villagers. Through their curiosities, Max and his family unwittingly ignite events that will invite the legendary Prince of Mist to once again tangle with humanity. This spooky story found its way onto the American Library Association 2011 list of Best Fiction for Young Adults. To qualify for the list, a book must meet the criteria of both good quality literature and appealing reading for teens. The list comprises a wide range of genres and styles, including contemporary realistic fiction, fantasy, horror, science fiction and novels in verse. The committee also selected a Top Ten list. It is a great read for any age. I found out yesterday that one of the most remarkable people I know has advanced stage melanoma. She is, as expected, taking the most aggressive approach toward wellness and has happily made it through her first round of biochemotheraphy. After I cried a bit for her situation, I began to think about how brave Sarah is and what book I might send along to her to prop her up a bit and allow her to spend some time with her three kids, as she fights this 4 month battle with her body. Quickly, I determined to find the bravest characters I know. The first two heros who popped into my mind are Mrs. Frisby and Frodo. In Mrs Frisby and the Rats of Nimh by Robert C. O'Brien, Mrs. Frisby risks everything to protect her son Timothy. Among the many risks she takes in her journey to preserve her family, she enters the tree hollow which is occupied by the wisest old owl for advice. As she trips on the bones of her kind, she faces her fears and secures the information she is after. All of the decisions she makes are selfless. In the end she is rewarded for her courage. To my great surprise, I just discovered that Jane Leslie Conly wrote a sequel to this beloved novel called Rasco and the Rats of Nimh. It seems to tell the story of the rats as they continue their journey. I have put it on hold at the library and will let you know right away if we get an update on Mrs. Frisby and her family. I am headed to Barnes and Noble now to send both of these books to Sarah. Her kids are 8 and 9, so this will be a perfect fit for family reading time. It also approaches illness in a gentle way and ends with wellness.